Well, I got home tonight and realized I left my laptop in the Woodson. This means a short post because I am far from adept with this newfangled iPad, but frankly my day was a bit of a circus so it’s probably all for the best anyway. What I do have for you are two delightful pictures of George H.W. 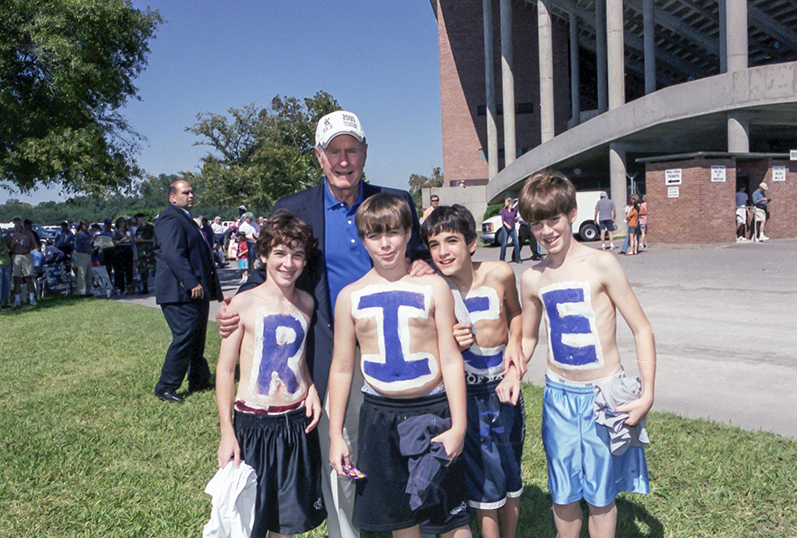 Bush at a Rice football game, the first a bold sartorial display with a happy Malcolm Gillis and the second with a bunch of kids outside the stadium. From everything I’ve seen and heard these are characteristic of the kindness and sense of fun he consistently brought with him to campus. As always, I’m grateful to Tommy LaVergne, who sent me these photos. Thank you and Tommy LaVergne for the wonderful photos. 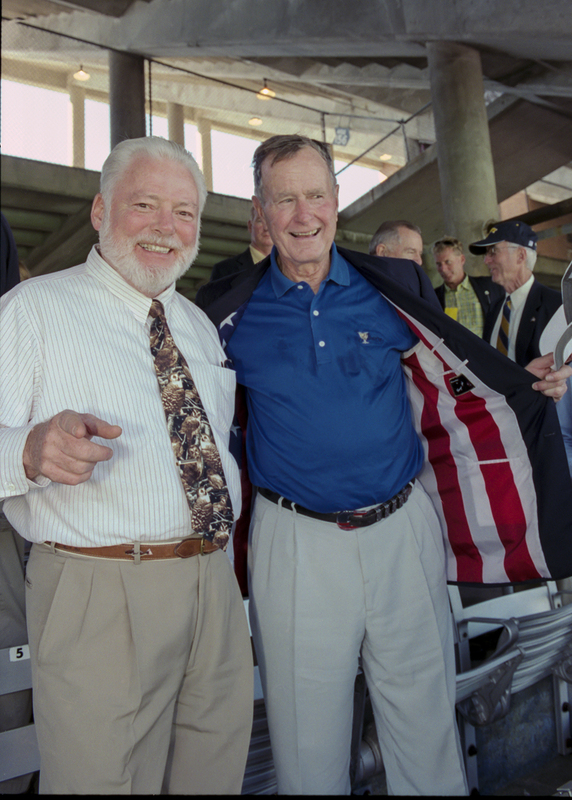 Found another photo that appears to be the same look for President Bush and Dr. Gillis of a US Navy photo (via Google Commons) for the Rice/Navy game on that day. How did you attach that photo? It eludes me, as do most things nowadays. Interesting how it shows up now. I just pasted a URL in the body of my reply, but it appears WordPress is converting that URL into an icon when presenting it. And it’s funny, because the e-mail notification to me of a response on this page shows the URL and not the hyperlinked icon. oct 18 2003. Navy 38 Rice 6, 50th anniversary of the SWC championship Rice team. I was the football manager that year.